This article was written by Dr Will Johnston and published in the Huffington Post on April 22, 2016. Dr Will Johnston is the Chair of EPC - BC. It is not surprising that many Canadians are concerned about the dangers of the new assisted suicide and euthanasia bill, C-14. What is really not credible is how the word-benders who used the Charter "right to life" to legalize the intentional suicide or killing of some patients are now protesting that they have been cheated of total victory. While they were in court, they said that all they wanted was for competent consenting adults who were suffering terribly at the end of life to be able to have a doctor kill them, with no criminal consequences for anyone. Now they are hopping mad that non-adults and those who are mentally incompetent, those unable to consent, those whose suffering is purely psychological, and those with years to live just might be excluded. They don't have to worry. The same semantic ju-jitsu which delivered the Carter decision to them will have no problem convincing the courts to invite whoever else to the death party. 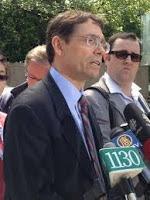 "Even Kay Carter would not have qualified under C-14" , says the BCCLA organization, which wants assisted suicide and euthanasia to be widely available. This is hard to believe. An awful lot of people will qualify under C-14. Are you eligible for your provincial medicare? Do you have a grievous medical condition (like Kay Carter's spinal stenosis)? Is it irremediable (if you decline surgery for spinal stenosis it automatically becomes irremediable)? Are you in an advanced state (not defined) of irreversible decline (spinal stenosis won't go away without surgery)? Is your situation intolerable (your call)? Is your death reasonably foreseeable ( like it is for 89 year olds like Kay Carter)? We just approved Kay Carter for assisted suicide. How hard was that? Now let's say you have some money and some real estate and your heirs are waiting for you to die. Your doctor does some tests and thinks you have something - let's call it malignant sarcophagosis. You are duly impressed and share your story with your beneficiaries. Under C-14, your beneficiaries can tell you how you don't have to suffer and how OK it would be with them if you let a doctor, nurse practitioner, or anyone aiding them kill you . Blatantly urging someone to commit suicide remains illegal, but how do we enforce that against a quiet word, a wink and a nod? One of your heirs can even sign the request for you, if you have difficulty writing. Then two independent doctors will agree that malignant sarcophagosis will work for you just like spinal stenosis would have for Kay Carter. It is not surprising that they will agree, because one of those independent doctors is the one who will kill you with an intravenous injection or provide you with suicide pills. The other doctor will reliably concur, not least because there is no limit to the doctor shopping to locate a compliant one. But what if your sarcophagosis is of milder sort, the semi-malignant kind? No problem, because your "natural death" just has to be "reasonably foreseeable", and no need to specify "the specific length of time." But what if the physicians goofed, and you don't have malignant sarcophagosis, or the mental competence to consent, or an uncoerced wish to die? No worries, because a blanket protection called "reasonable but mistaken belief" about "any fact" protects them even if you are dead as a result. Oh, by the way, absolutely anyone is allowed to "assist" you to administer your suicide dose, with no oversight yet mentioned in this law. If you had changed your mind and struggled, who would know? Meanwhile, aboriginal leaders, including Liberal MP Robert-Falcon Ouellette , are justified in wondering where the intensity required to prevent suicide among youth is going to come from. If one ounce of the effort that has been put into assisted suicide and euthanasia had gone toward suicide prevention, or of course palliative care, it would be easier to take the howls of outrage from the extremists for whom C-14 will never go far enough. So what should be done? Ideally, throw out the law, and strengthen the wording of the current law against assisting suicide (because the Supreme Court played games with the old wording about needing to protect only the "vulnerable"). Make palliative care access, not suicide access, mandatory in law. But failing that, at bare minimum ensure independent third party review before all proposed deaths. Don't let any two wannabe Kevorkians wave these things through. Defend the rights of all Canadians by guaranteeing that no doctor or institution will be coerced to participate, and say so loud and clear in the law. We must not leave such a pillar of our freedom to an uncertain fate inside Ministry of Health regulations, which, "for lack of time," have not yet been revealed. I attended your excellent seminar at the U of T last year, and I remember that you asked why doctors should be expected to do the killing. I say, let the judges do it.